“Fluzone High-Dose” is a new influenza vaccine manufactured by Sanofi Pasteur. The new vaccine was created specifically for seniors, 65 and older. The Centers for Disease Control and Prevention are quick to reassure seniors that Fluzone is just as safe as regular seasonal flu vaccines. If you read the details on the CDC website, however, you will quickly realize that Fluzone may not be as safe as claimed. .
Fluzone appears to cause a lot more side effects, including fevers. “The safety profile of Fluzone High-Dose vaccine is similar to that of regular flu vaccines, although adverse events (which are also reported after regular flu vaccines) were reported more frequently after vaccination with Fluzone High-Dose. 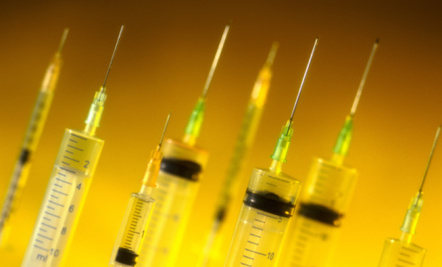 Why do Seniors Get a Higher Dose Vaccine? One of the primary differences between the ‘regular’ Fluzone vaccine and Fluzone High-Dose for seniors is that the latter contains four times as much microbial antigen—the lab altered flu viruses – that prompt your body to produce antibodies to the three different influenza strains contained in the flu vaccine. The idea is that seniors need more antigen in order to provoke the desired immune response, because studies have found that the flu vaccine creates only a weak immune response in the elderly. In essence, they’ve realized that the flu vaccine does not work in the elderly, and the belief is that upping the dose will do the trick. “Data from clinical trials comparing Fluzone to Fluzone High-Dose among persons aged 65 years or older indicate that a stronger immune response (i.e. higher antibody levels) occurs after vaccination with Fluzone High-Dose. What this means is that for the next four years or so, seniors receiving this much more potent dose of the flu vaccine are participating in what amounts to an uncontrolled experiment. There is already admission that nobody knows whether it will actually prevent seniors from getting the flu or not! According to the manufacturer’s safety studies, compared to the regular Fluzone vaccine the high-dose version not only resulted in more frequent reports of common adverse reactions, it also caused slightly higher rates of Serious Adverse Events (SAE’s). While the annual flu vaccine is touted as the “best” way to avoid catching the seasonal flu, what many fail to realize is that there’s virtually NO good scientific evidence to support it. Again and again, the Cochrane Database Review—which is the gold standard for assessing the scientific evidence for the effectiveness of commonly used medical interventions—has concluded that flu vaccines do not appear to have any measurable benefit either for children, adults, or seniors. 3. Ditto for children. A large-scale, systematic review of 51 studies, published in the Cochrane Database of Systematic Reviews in 2006, found no evidence that the flu vaccine is any more effective than a placebo in preventing influenza in children under two. The studies involved 260,000 children, age 6 to 23 months. 4. Two years, later, in 2008, another Cochrane review again concluded that “little evidence is available” that the flu vaccine is effective in preventing influenza in children under the age of two. “Over 200 viruses cause influenza and influenza-like illness, which produce the same symptoms (fever, headache, aches and pains, cough and runny noses). Without laboratory tests, doctors cannot tell the two illnesses apart. Both last for days and rarely lead to death or serious illness. At best, vaccines might be effective against only influenza A and B, which represent about 10 percent of all circulating viruses. Each year, the World Health Organization recommends which viral strains should be included in vaccinations for the forthcoming season. Authors of this review assessed all trials that compared vaccinated people with unvaccinated people. The combined results of these trials showed that under ideal conditions (vaccine completely matching circulating viral configuration) 33 healthy adults need to be vaccinated to avoid one set of influenza symptoms. Is it really worth risking the health and well-being of 100 people in order to prevent ONE case of the flu, which may or may not result in serious illness or death in that one individual to begin with? Since the flu vaccine myth is nearing its ultimate demise, what is the best way to avoid contracting the flu each and every year? The answer lies in maintaining a robust immune system, and the first thing you want to do when you feel yourself coming down with a cold or flu is to avoid ALL sugars (fructose in particular), artificial sweeteners, and processed foods. This also includes fructose from fruit juice, and all types of grains (as they break down as sugar in your body). It’s important to remember that excessive sugar consumption effectively suppresses your immune system and impairs your defenses against all infectious disease. I also strongly recommend taking one specific action that can help reduce your chances of ever developing symptoms in the first place, and that is to make sure your vitamin D levels are optimized year-round. There’s a new hypothesis stating that the widespread prevalence of colds and flu’s may actually be due to vitamin D deficiency, which is incredibly common in the United States, especially during the winter months when cold and flu viruses are at their peak. In the largest and most nationally representative study of its kind, people with the lowest vitamin D levels reported having significantly more recent colds or cases of the flu. In another study, schoolchildren were given either vitamin D or a placebo for a year. Influenza A occurred in just 10.8 percent of the children in the vitamin D group, compared with 18.6 percent children in the placebo group. While the temptation to reach for a vitamin D3 supplement can be great, I urge you to make a concerted effort to optimize your levels by getting adequate sun exposure or by using a safe tanning bed, even in the winter months, if you can. Because when you expose your skin to sunshine, your skin synthesizes vitamin D3 sulfate. This form is water soluble, and can therefore travel freely in your blood stream. Oral vitamin D3 supplements are NOT sulfated, and therefore require LDL (the so-called “bad” cholesterol) as a vehicle of transport. According to Dr. Stephanie Seneff, there’s reason to believe that the oral non-sulfated form of vitamin D may therefore not provide the same benefits as the vitamin D created in your skin from sun exposure, because it cannot be converted to vitamin D sulfate. However, if you do not have access to a safe tanning bed or sunshine then it is best to take oral vitamin D3. New research shows that the dose MOST adults need to reach therapeutic levels is 8,000 units per day. If you are taking 5,000 IU’s, you may want to consider increasing it as most adults need more. Of course it is important to confirm your blood levels though, as some people require considerably more in order to reach therapeutic levels. Aside from boosting your vitamin D levels and abstaining from sugary foods, additional long-term prevention strategies include getting plenty of quality sleep, exercising regularly, and effectively addressing the daily stresses of your life. Taken together, these strategies lay the groundwork for a robust immune system that can stand up to all kinds of viral and bacterial assaults. Zinc—According to a Cochrane Database Review of the medical research on zinc, when taken within one day of the first symptoms, zinc can cut down the duration of a cold by about 24 hours. It was also found to greatly reduce the severity of symptoms. Chicken soup—Chicken contains a natural amino acid called cysteine, which can thin the mucus in your lungs and make it less sticky so you can expel it more easily. For best results, make up a fresh batch yourself (or ask a friend or family member to do so) and make the soup hot and spicy with plenty of pepper. The spices will trigger a sudden release of watery fluids in your mouth, throat, and lungs, which will help thin down the respiratory mucus so it’s easier to cough up and expel. Mushrooms—While most people think only of eating the fleshy fruiting body of the mushroom (the part that grows above ground), most of the benefits are actually located in their complex root structure, called the mycelium. Beta glucans and proteoglycans are the primary biologically active compounds in the mushroom fruit body and mycelia that support your immune system. The beta glucans are special proteins with unique side-branching patterns that “fit” perfectly with cellular receptor sites that support your immune system, just like a key in a lock.Mushrooms also contain trace minerals, polysaccharides, amino acids and fiber that support your health by protecting against environmental stressors; supporting your detoxification process; and promoting healthy gut flora and optimal digestion, just to name a few of the known health benefits. I should be careful... I have never had a flu shot and do not know what to look for. I've gotten sick for weeks after getting a flu shot for years. Three years ago, I got a shot at the end of October and basically was confined to bed for the next 2 months. On New Year's Day I visited the ER because the symptoms were so bad. It took another month and 2 rounds of antibiotics to finally knock everything out. Since then I haven't had a flu shot and guess what? Haven't had the flu, colds are less severe and of short duration, and I no longer have recurring sinus infections. Coincidence? I don't think so. Wouldn't touch with 200000 foot pole. I've gotten the flu shot twice in my life...both times I got REALLY sick. Certainly Tamiflu & some others are a con & just to make large profits for the Pharmaceutical companies. mostly make sure you are healthy with a good diet. I usually have a flu jab in UK but then they are more careful with what you are given.